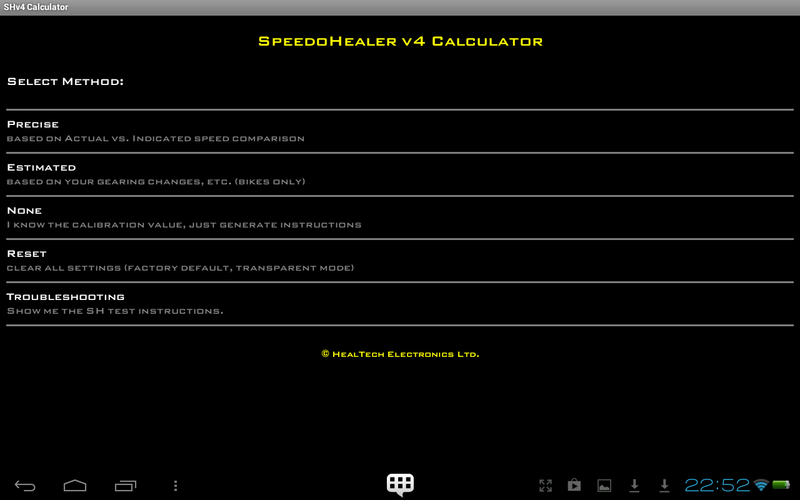 Here is a picture of the Healtech Speedohealer V4. In an effort to reduce weight and tweak the performance, I went for the Renthal ultralight sprockets in the 525 chain size. I also reduced the tooth size on the front sprocket. The result of this was great but found that the speedo was no longer as accurate. I needed a product to correct the speedo and having used the Healtech Gear shifter decided to this was a good choice. Dual Bank Memory - Allows the Speedohealer to store two configurations. Km/h conversion - Allows switching between Km/h and MPH easily. Extended calibration range - Allows setup for most configurations. As the photo shows, its a neat little unit with an LED, two connectors and two switches. It is 5cm x 3cm x 1.5cm so wil fit in the smallest of places on the bike. In my case the battery area. The unit is sealed but unlikely to be waterproof. It should however survive an occasion splash from our summer weather. 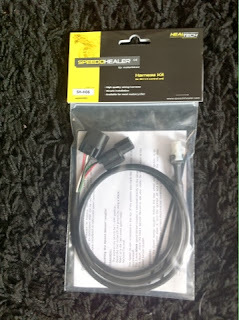 There are two connectors on the Speedohealer.The four pin plug connects to the speed sensor which is located on the top of the gearbox and the two pin connector which can be used with a cable and switch to display the top Speed memory. There are two harnesses available for the Fireblade. These are the SH-U01 which is a universal kit that would require modification to the existing loom and the SH-H06 which is a plug and play cable that connects between the stock connector and the gearbox plug. I have been lucky enough to obtain both harnesses but will use the SH-H06 as I am not a fan of tinkering with the stock wiring unless absolutely necessary. Installation is quite straight forward if you have ever installed a power commander, spark plugs or air filter. You need to remove the plastic tank cover and lift the metal fuel tank to access the connector. Fortunately help is at hand as Healtech have some good quality information available to help. Here is the basic installation details provided by Healtech. Further to this, Healtech share documentation by others. Here is a link for the SH-U01 universal installation kit. Here is link to the guide for the SH-H05 harness for the 2008 CBR1000RR. I used the guide for the SH-H05 to complete the installation which was clear and straight forward. There are a couple of ways to calibrate the speedo. Precise method allows the use of devices like GPS to work out the correct setting. I will be using the estimated method. Healtech have devised a great Android App which is free that allows you to work out the settings effortlessly. As I have an Android Tablet this was quick and easy. After setting the configuration, I performed the test which involves the real wheel being rotated. I am not a mechanical genuius by any means. I found the unit is compact and easy to understand with lots of easy to read installation guides. It took around an hour to install and setup which was at a steady pace. I highly recommend this item even if like me you felt you could live for a while with an incorrect speedo. Whilst I will not need the dual setting and the top speed memory, these are great for track day riders who use different setups and interested in the top speeds.